Water may be contaminated by a variety of substances. To protect public health, Maximum Contaminant Levels (MCLs) have been established. The concentration of a particular contaminant in drinking water must not exceed it’s MCL. To assure that water served to the public is routinely checked for bacteriologic, chemical, and radiologic quality, a Monitoring and Reporting Program has been established. The contaminants which must be sampled for, and the number of samples which must be taken, varies with the size and nature of the water system. Samples must be routinely taken by water suppliers to determine whether MCLs have been exceeded. Minimum sampling frequencies are prescribed by rule. Information on specified sampling frequencies is provided below. If certain requirements are met, sampling waivers may be granted. If MCLs are exceeded, or a water system fails to take the necessary number of samples, the public must be notified. Operators of treatment facilities must submit monthly report forms. Samples must be analyzed by a Certified Laboratory. These laboratories may be able to perform the required testing. certified laboratory as required for the appropriate analysis. Three types of monitoring waivers are available. Description of the overall approval process for getting a new source approved. Specific chemical sampling protocol has been established for any new or proposed drinking water source. 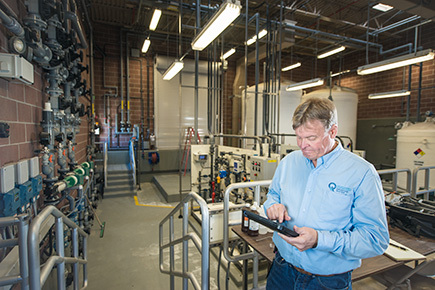 The Division has finalized its policy allowing chemical sampling for sources that combine at an entry point to the distribution system, and sources in a common aquifer. For a common entry point grouping, the policy states that in order to maintain the entry point status that systems must submit to DDW a sampling plan. If a system has sources in a common aquifer then you must apply for those sources to be grouped into a sampling station. The requirements for this application are in the Entry Point and Common Aquifer Policy. The deadlines for a system to submit either the sampling plan or the common aquifer application are in the policy. EPA’s water laws and regulations based on the Safe Drinking Water Act. Basic information about EPA’s UCMR 2. Radon facts and top-rated radon test kits. EPA’s Unregulated Contaminant Monitoring Program. Developed by USU Extension Services, this tool allows users to enter their water quality data online and receive interpretation of those data pertaining to drinking water, irrigation water, livestock water, and environmental water state standards.